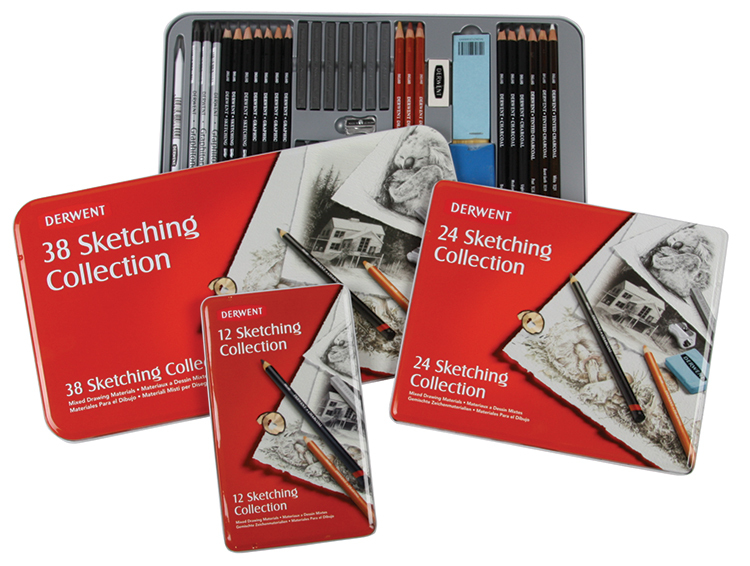 These imaginative collections of drawing and sketching media are ideal for creating dramatic drawings and illustrations, from loose, free style sketches to detailed portraiture. Each collection contains a creative mix of Derwent Drawing, Pastel and Charcoal pencils plus Watersoluble sketching pencils together with natural graphite and compressed charcoal blocks. The larger sets also contain Watersoluble Graphitone, a stick of pure artist quality graphite and complementary accessories including an eraser and sharpener. 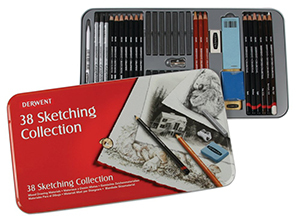 The Sketching Collections are available in tins of 12, 24 and 38; the contents vary in each set. Please see below for the contents contained in each set. An ideal introduction to the world of sketching. 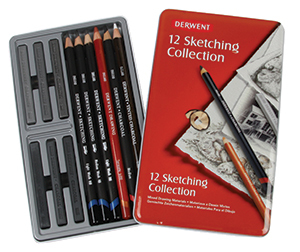 These sets contain a range of pencils, blocks and sticks which can be used separately or together for preliminary sketches or final dramatic black and white drawings. Each of the Derwent Sketching Collection tins is available here. Draw Parallell lines closely together to create tone and depth. Draw a series of parallel lines, crossing each other at angles, to add texture and form. Graduations are smooth transitions from a light to a darker tone. Press the pencil lightly or hard to alter the tonal density. Apply on the longest side for a broad lay down of tone, break into chunks to lay down specific widths, use the edges and corners for crisp lines and fine detail. To add highlights to graphite and charcoal drawings, use the white Pastel pencil or simply let some original paper show through. Use for blending dusty media such as charcoal or pastel. Create an outline drawing with a non-soluble pencil such as Derwent Graphic then add tone with a watersoluble pencil. Next apply a light water wash to your drawing while retaining the original outline. Use to remove complete areas of graphite or unwanted marks from your drawing. For highlighting, stippling and ghosting, mould the eraser until soft, pull into a point and carefully remove layers of graphite or pigment as required. Apply to a pencil point or block to achive the exact angle required. An easy way to achieve a fine point on your pencils.